Back in December, I read and really enjoyed Danika Stone’s debut YA novel All the Feels. Because I loved how fun it was to read, I decided to request her sophomore YA novel from the Indigo ARC newsletter, only expecting really good things. I have to tell you that I did not just get good things, but amazing things out of this book. I had quite an exciting ride while reading Internet Famous. I loved the characters and the storyline, and ultimately, I just want more! For a synopsis, this book follows a teenage girl named Madi. She has a fandom-based blog on which she rambles about all of her interests, but along with it, she juggles the responsibilities of schoolwork, family, friends, and more. Her attitude changes for worse when her mom leaves her family. As well, when a troll spams rude comments onto her blog, she and an online friend named Laurent work together to unravel the mystery of the troll’s identity. Madi was a very interesting character to read about, and I mean this in a good way. She was intuitive and she was great at understanding others’ feelings as well as her own. Though sometimes she felt overwhelmed because of her family, the troll comments on her blog, and a few other things, she definitely overcame that and ended up as her better self by the end. I really loved Laurent as well- he was so dreamy! For one thing, he was French (ooh la la! ), and for another more important thing, he was the sweetest and kindest guy ever! I loved how Laurent was always by Madi’s side during the times of trouble, and I adored how well the two clicked! 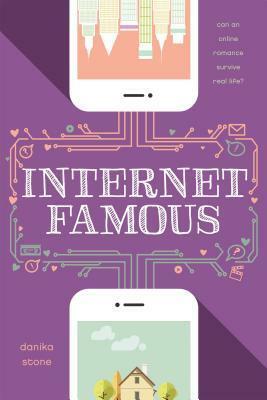 Internet Famous was- well, almost- unputdownable. I was extremely interested and engrossed by the plot about the mystery of the troll and even though some of the events were a tad predictable, who the troll really was had me surprised. I loved it! To conclude, Internet Famous was an adorable, super fun read that I devoured. The characters were both likeable and relatable, the plot was gripping, and Stone’s writing style is engaging and amusing. If you are looking for a novel that blends fandom, blogging, and romance all into one, then this fluffy book is your best bet! I absolutely adore the cover on this!